Sunday night was a fraught experience. Having slept in a wee bit too long that morning, there was a bit of tossing and turning when bedtime came around. Sleep finally did arrive, but it brought some pretty horrific nightmares with it. 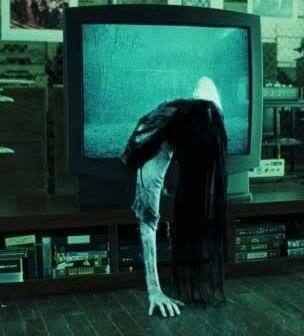 Except it was a window she was crawling through, riding a crest of murky water, not a TV screen. The car varied, the crash varied, the body of water varied - from station wagons plunging off bridges to little convertibles swerving off country roads into rivers - but it always came back to me, terrified at the rising water, panicking and trying to escape, and then BOOM, exploding glass, torrent of dirty, dark water and that freaking scary lady. I would wake up, try to shake it off, go back to sleep, and I'd be right back in another car. Now, I've been having a bit of anxiety tummy since last week. You know that feeling that lives right under your breastbone? A kind of buzzing like you swallowed a brick of wasps and you kind of want to puke them up or do something to make that pressure-buzzy feeling go away but you can't? Yeah, I've had that feeling for no discernible reason since last week. As though I'm forgetting something hugely important or royally effing something up because the clock is ticking and I haven't taken care of it...but I can't point to what the something is. I just have a consistent sense of anxiety for what appears to be no reason at all.